Tomorrow evening, I’m going to stand up in front of a crowd of 1,000 people at the Royal Oak Music Theatre in my bra. Before you begin thinking that this is not reality, but perhaps an anxiety-provoked nightmare — let me explain. It’s a very special bra, it’s for a great cause, and I won’t be the only one. Saturday night is the second annual Bras for a Cause event, featuring Art Bras modeled by breast cancer survivors. There will be 22 of us modeling the 70 Art Bras donated by local celebrities, artisans, survivors and their family and friends. Last year’s event raised a whopping $50,000 for Gilda’s Club of Metro Detroit. I was going to wear one of the bras that had already been created. Then, I had an idea. I was sitting around one day thinking about DNA and the double helix — everyone does this from time to time, right? — when it hit me. I could design a bra featuring the double helix! Great Idea. Now, how to get it from my head and onto a brassiere? Enter my mother-in-law, Margaret Neilson, also a breast cancer survivor and one smart cookie. I showed her my idea on paper and within a couple of days, she had created the pattern and sewn the beads onto a bra in the shape of the Double Helix. Then, she and I added red feathers from a boa, sequins, test tubes I’d ordered from an online lab (they probably think they’ve got a new customer! ), and red trim. Wallah! One DNA double-helix bra! But the wheels in my brain couldn’t stop turning. The bra was the beginning of a Science theme — complete with lab coat, Geek glasses (I found them in the Geek section at the Halloween store! 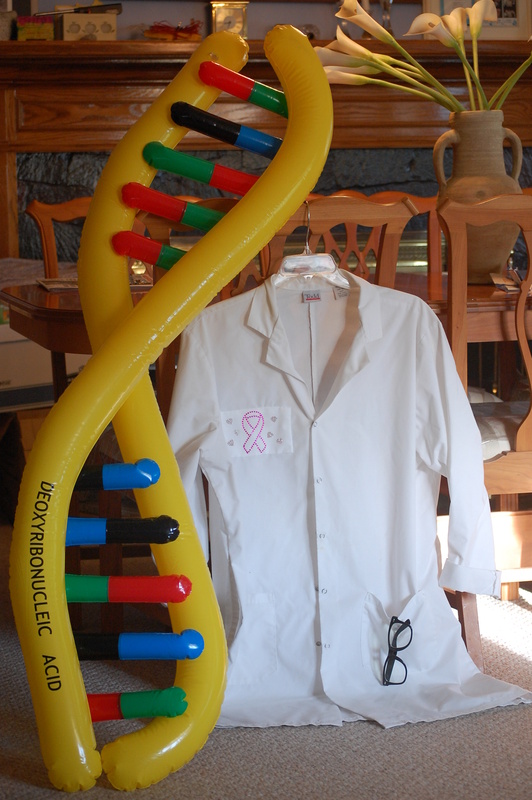 ), a five-foot-tall inflatable DNA double-helix beach toy, and music choice: Thomas Dolby’s Blinded Me With Science. Not only am I a science geek, but this theme is particularly meaningful to me as the form of breast cancer I carry is indeed in my genes — identified as the Breast Cancer 1 gene (BRCA 1). It was an exhilirating moment when we hot-glued the last of the trim on the bra and held it up. Then, I began to worry. I worried about how I’d look on stage. I’m not model thin. Then I happened across the words from some of last year’s models, reminding me of what I already know: It’s not about being model thin. It’s a celebration of life — beating breast cancer and coming out on the other side healthy enough to create such a bra — and model it in front of 1,000 people. Through a silent and live auction of the bras as well as items donated by businesses and celebrities (think autographed Red Wings’ jerseys! ), as well as through ticket sales (100 percent of proceeds go to the charity), I’m playing a small part in raising money to support other young people diagnosed with the disease in their 20s and 30s. And that is plenty of reason to strut a runway in a bra!